2018 Oct 11th Tropical Storm Michael passes over while moving N.E with 55mph winds. 1876 September 17 ,75mph to the west from the south. Average 5 minute wind speed at Cape Henry was 78 mph; 8.32" of rain. Great destruction of crops & teers,streets littered with fences & debris. 1878 Oct 23rd from the south 90mph hurricane hits just west by 37 miles with a press of 28.78 eye made landfall at Cape Fear and moved north across Richmond and Washington DC.Ship A.S Davis sinks in hurricane 19 men lost.Huge surge through Chesapeake region & along Delmarva shore with highest tides since 1821. 1894 Oct 10th,75mph from the SSW passes just east by 24 miles. 1899 Aug 18th,90mph from the S.E passes just east by 44 miles before turning away from Norfolk. 1955 August 13th,Hurricane Connie still a hurricane with 80mph winds (hurdat) while weakening moving north passes directly over. 1986 Aug 18th from SSW Hurricane Charley hits after passing over East N.C with 80mph winds,Norfolk on weak side of storm. 1996 July 13th Hurricane Bertha approaches from the SSW with 75mph while weakening to tropical storm. 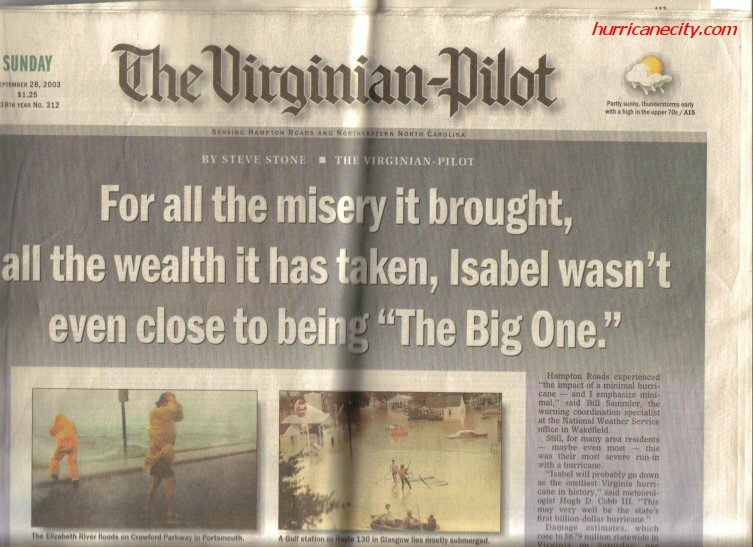 1999 sept 16 hurricane Floyd passes directly over the area with 75mph winds from the south,causes heavy flooding of souns from storm surge as well as from very heavy rain. Lowest Pressure 28.85" - 977 MB - 4 th lowest of record. 10-20" of rain on saturated ground resulted in 500 year flood of record for Franklin, VA. WFO Wakefield was inaccessible for 36 hours.